The Melbourne Rebels blew a huge opportunity to put a real gap – a three-win gap, if they were good enough – on the rest of the conference on Friday night, by turning out exactly the sort of performance that has brought them undone in previous seasons. And because of their improvements in both playing personnel and performance in 2019, the loss to the Stormers is doubly bad. So the gap remains seven points over the Waratahs, with the Brumbies and Reds one and two points further back, respectively. That’s not a conference-deciding lead yet, but the next few weeks will go a long way toward doing just that. Or, at the very least, decide a few seasons. Was the Stormers loss a mere blip on the way to an inevitable conference title for the Rebels? 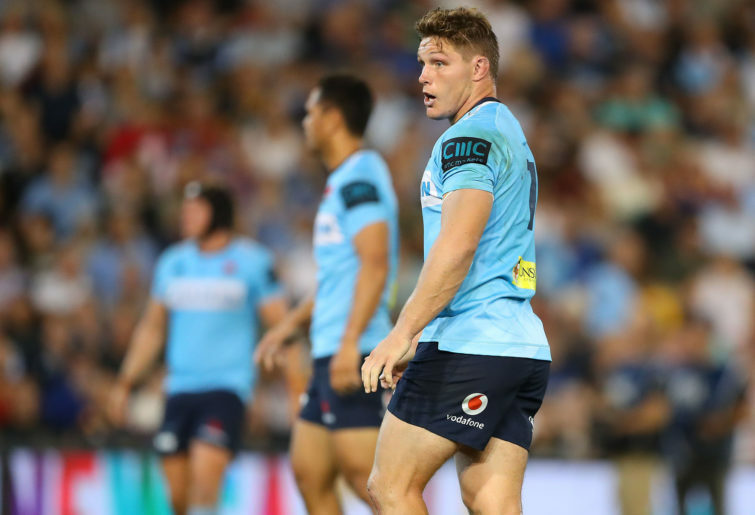 Do the Waratahs have the mental toughness within their playing group to emerge from the last week of drama a better side? Both sides will be hoping the answer to their respective questions is ‘yes’. For the Waratahs, this match at the SCG on Saturday is a chance to claw one back and prove that the conference is no foregone conclusion. For Melbourne, a strong win and some other results could see them open the 11 or 12-point lead they should have last week. NSW will be desperate to put this last week behind them and prove that they do have the ability to move on without one player. And even that they deserve to be thought of as a side capable of competing with the top sides. The Rebels need to show that they do still know how to beat the teams they should be beating. After the Tahs, they have a bye week to get ready for the Hurricanes in Wellington. If the home side can get a win, they have dates with the Sharks and Bulls either side of the Indian Ocean. The Brumbies did well to claw back from the less-than-ideal start against the Lions, to the point that they were 19-8 up by the time they went to the sheds. Once they established that the best way to the beat the big opposition forwards was to play wide and around them, the Aussie side found some form resembling the rugby they’ve been wanting to play all season. But a tour to Cape Town and then Buenos Aires is hardly what you’d want to face when you need to string wins together. And the ACT side do need to. Their current 3-5 record is one of underperformance, and so a couple of wins on tour can certainly help set up a run home. They do tour reasonably well, too; they’ve won two of their last three in South Africa over the last two seasons, and beat the Jaguares at home in 2017 too. But the dreaded ‘c’ word is the biggest issue. They’ve not won games on the trot yet, nor have they won away from Canberra Stadium. Just another thing to rectify on tour before facing the Blues back at home. The Reds didn’t have a great time in Pretoria last weekend, and worse, they had some camera and video gear knocked off between Johannesburg and Durban, where they’ll meet the Sharks this weekend. And on paper, it should be good contest, given the Sharks were similarly underwhelming at home to the Jaguares last weekend, too. But the Sharks now shape as must-win for Queensland, for the same reason the Brumbies have to win in Cape Town. Teams with only three wins at the halfway point simply can’t afford to be dropping any more. The Reds also need to find some connection in their stilted attack; the forwards have been going okay the last few weeks – okay, but a long way off perfect – but their attack continues to look disjointed and misfiring. Another display like that could see the Sharks run up a score – if they’re consistent enough themselves. The Reds have a bye after returning home, and from there they face the Sunwolves. And what of the mighty Moondogs? The only team with a 2-6 record, the Sunwolves would basically need to win all but one of their remaining eight games to feature in the back-end of the season. And that would obviously be entertaining for a number of reasons, not to mention what kind of lead-in it might give to the Rugby World Cup in Japan later in the year. The Sunwolves have twin Saturday afternoon games – against the Hurricanes and Highlanders – to come, before the Reds game in Brisbane. I, for one, will be more on board than ever if they win those. And if they could, well maybe they could yet have an impact on the Australian conference before the season is out.